Even though the world cup is still going on – and is still eating the bit of time I have besides university and job – let’s have a folktale today with no connection to any world cup participant. This one is from Lapland. Once upon a time an old man lived in a miserable hut with his old wife. They were so poor that they had not a single thing of worth but for a golden button on top of the woman’s spindle. It was the man’s habit to go either hunting or fishing every day to provide for their basic livelihood. Not far from the hut, there was a big hill. And people believed that there lived an elf inside who was called Kidhus and who one should be wary off. Back to Mongolian animal tales. It’s been way too long. And this one is an epespcially interesting one. A long time ago there was a lama, a Buddhist monk, who spent his time in deep meditation. Next to him there lay a cat. One day the cat stole the lama’s snuff bottle and the lama went after the cat and got his snuff bottle back. Then another time the cat stole the lama’s rosary and hid in a hole. When the lama grabbed the cat by the tail, the tail suddenly got torn off. So the mice went to the cat and let her teach them. After a few days had passed Khuchin tuct, the khaan of the mice, told them: “Oh, it seems as if our teacher is eating us. In her excrements there are traces of bone and hair. Go back home and get a bell.” He sent a few mice to carry out his request. Sorry. Could thing I warned you that the posts might be not as regular. Between the world cup and apartment hunting and a presentation at university… Gah. But today, let’s have another one of the most famous fables by Aesop. And beware of the very political contemplations at the end of this post. 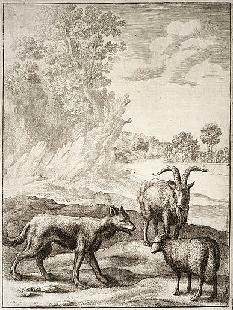 wolf, lamb and the - ghost of its father? Actually, I just wanted to post another classic with this famous fable by Aesop but incidentally – I’m also keeping with the idea of posting a tale from a nation in the football world cup. As Greece played today, winning against Nigeria as well. One evening in autumn, a mouse and a sparrow sat beneath a grape-vine chatting about this and that. Suddenly, the sparrow chirped to his friend: “Hide yourself, the fox is coming!” And he himself quickly flew up into the vine’s foliage. The fox sneaked closer and closer to the grape-vine, his eyes longingly on the fat, blue, overripe grapes. Carefully he peeked into all direction. Then he pounced, put his fore-paws against the vine’s stem, stretched his body and tried to catch a few grapes with his mouth. Alas, they were hanging too high. Somewhat angered, he tried his luck again. This time he took a giant leap but again he only caught empty air. He tried a third time and he tried as hard as he could, jumping with all his might. Almost beside himself with greed, he snapped after the juicy grapes and stretched and stretched until fell down on his back. Not a single leaf had moved. The mouse peeked out from her hiding place and piped up: “Do not bother, you will never get the grapes.” And like an arrow she shot back into her mouse-hole. The fox bit his teeth, turned up his nose and said loftily: “They are simply not ripe enough yet. I don’t like my grapes sour.” And with his head held high he pranced back into the forest. Re-reading this fable, I’m wondering about hens and eggs. Because has this one become a classic because it successfully and entertainingly embodies the lesson about over-ambition and pride which is at the heart of Western societies. Or has this critical stance on ambition and pride become central because it has been advocated in central socio-cultural texts such as these? Huh. Firstly, to let you know that my posting might be somewhat irregular until July 11th as the football world cup is going on and I’m watching way too much of it. There once lived a turner who was in the habit of going into a forest which was some distance from his cottage to cut down wood to make spoons. One day as he was sawing a venerable old chestnut tree he noticed a deep hole in the tree, and being curious to see what was inside he unluckily penetrated within, and immediately an enchanted Moor came forward to meet him, and in angry tones at the intrusion said to him: “Since you have dared to penetrate into my palace I order you to bring me the first thing you shall meet on reaching your cottage, but take heed that you comply with my command, otherwise you will surely die within three days.” The turner now departed and went home, where he had three daughters and a little pet dog which always came to the door to meet him. This Mongolian animal tale one is actually representing a particular type of the genre: three friends, one gets trapped, another one wants to eat him, the last one comes to the rescue. Sounds kind of like the tale about the lame magpie? Yeah, no. Not really. But read for yourselves. Especially since you can never read too many Mongolian animal tales. A very long time ago, I cannot tell you when, it is so long since, there lived in a town in Herefordshire a baker who used to sell bread to all the folk around. He was a mean, greedy man, who sought in every way to put money by, and who did not scruple to cheat such people as he was able when they came to his shop. He had a daughter who helped him in his business, being unmarried and living with him, and seeing how her father treated the people, and how he succeeded in getting money by his bad practices, she, too, in time came to do the like.